The gallon (/ˈɡælən/) is a unit of measurement for volume and fluid capacity in both the US customary units and the British imperial systems of measurement. Three significantly different sizes are in current use: the imperial gallon defined as 7000454609000000000♠4.54609 litres (4 imperial quarts or 8 imperial pints), which is used in the United Kingdom, Canada, and some Caribbean nations; the US gallon defined as 231 cubic inches (4 US liquid quarts or 8 US liquid pints) or exactly 3.785411784 litres, which is used in the US and some Latin American and Caribbean countries; and the least-used US dry gallon defined as 1/8 US bushel (4.405 L). The IEEE standard symbol for the gallon is gal. The gallon currently has one definition in the imperial system, and two definitions (liquid and dry) in the US customary system. Historically, there were many definitions and redefinitions. There were more than a few systems of liquid measurements in the pre-1884 United Kingdom. The imperial (UK) gallon, now defined as exactly 7000454609000000000♠4.54609 litres (about 277.42 cubic inches), is used in some Commonwealth countries and was originally based on the volume of 10 pounds (approximately 4.54 kg) of water at 62 °F (17 °C). The imperial fluid ounce is defined as 1/160 of an imperial gallon; there are four quarts in a gallon, two pints in a quart, and 20 imperial fluid ounces in an imperial pint. The US gallon is legally defined as 231 cubic inches, which is exactly 3.785411784 litres. A US liquid gallon of water weighs about 8.34 pounds or 3.78 kilograms at 62 °F (17 °C), making it about 16.6% lighter than the imperial gallon. There are four quarts in a gallon, two pints in a quart and 16 US fluid ounces in a US pint, which makes the US fluid ounce equal to 1/128 of a US gallon. In order to overcome the effects of expansion and contraction with temperature when using a gallon to specify a quantity of material for purposes of trade, it is common to define the temperature at which the material will occupy the specified volume. For example, the volume of petroleum products and alcoholic beverages are both referenced to 60 °F (15.6 °C) in government regulations. This dry measure is one-eighth of a US Winchester bushel of 7003215042000000000♠2150.42 cubic inches; it is therefore equal to exactly 268.8025 cubic inches or about 6997440500000000000♠4.405 L. The US dry gallon is not used in commerce, and is not listed in the relevant statute, which jumps from the dry quart to the peck. Typical units of gasoline in each country. Gallons used in fuel economy expression in Canada and the United Kingdom are imperial gallons. Despite its status as a U.S. territory, and unlike American Samoa, the Northern Mariana Islands, Guam, and the U.S. Virgin Islands, Puerto Rico ceased selling gasoline by the US gallon in 1980. The gallon was removed from the list of legally defined primary units of measure catalogued in the EU directive 80/181/EEC for trading and official purposes, with effect from 31 December 1994. Under the directive the gallon could still be used – but only as a supplementary or secondary unit. One of the effects of this directive was that the United Kingdom amended its own legislation to replace the gallon with the litre as a primary unit of measure in trade and in the conduct of public business, effective from 30 September 1995. Ireland also passed legislation in response to the EU directive, with the effective date being 31 December 1993. Though the gallon has ceased to be the legally defined primary unit, it can still be legally used in both the UK and Ireland as a supplementary unit. The United Arab Emirates started selling gasoline by the litre in 2010, along with Guyana, and Panama in 2013. The two former had used the Imperial gallon and the latter the US gallon until they switched.Myanmar (Burma) switched from Imperial gallon to litre sales before 2014. The Imperial gallon continues to be used as a unit of measure in Anguilla, Antigua and Barbuda, the Bahamas, the British Virgin Islands, the Cayman Islands, Dominica, Grenada, Montserrat,  St. Kitts & Nevis, St. Lucia, and St. Vincent & the Grenadines. 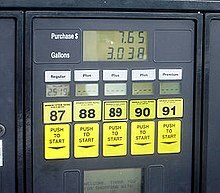 Other than the United States, the US gallon is used in Liberia, Belize, Colombia, The Dominican Republic, Ecuador, El Salvador, Guatemala, Haiti, Honduras, Nicaragua, and Peru, but only for the sale of gasoline. All other products are sold in litres and its multiples and submultiples. Antigua and Barbuda planned to switch over to using litres by 2015, but as of 2018[update] the switch-over had not been effected. In the Turks & Caicos Islands, both the U.S. gallon and Imperial gallon are used, due to an increase in tax duties disguised by levying the same duty on the 3.79 L U.S. gallon as was previously levied on the 4.55 L Imperial gallon. Both the US liquid and imperial gallon are divided into four quarts (quarter gallons), which in turn are divided into two pints. These pints are divided into two cups (though the imperial cup is rarely used now), which in turn are divided into two gills (gills are also rarely used). Thus a gallon is equal to four quarts, eight pints, sixteen cups or thirty-two gills. The imperial gill is further divided into five fluid ounces, whereas the US gill is divided into four fluid ounces. Thus an imperial fluid ounce is 1/20 of an imperial pint or 1/160 of an imperial gallon, while a US fluid ounce is 1/16 of a US pint or 1/128 of a US gallon. The imperial gallon, quart, pint, cup and gill are approximately 20% larger than their US counterparts and are therefore not interchangeable. The imperial fluid ounce, on the other hand, is only 4% smaller than the US fluid ounce and therefore they are often used interchangeably. Historically, a common bottle size for distilled spirits in the US was the "fifth", that is, one-fifth of a US gallon. Spirit sales in the US were switched to metric measures beginning in 1976; a 750 ml bottle is still sometimes known as a "fifth". The term derives most immediately from galun, galon in Old Northern French, but the usage was common in several languages, for example jale in Old French and gęllet (bowl) in Old English. This suggests a common origin in Romance Latin, but the ultimate source of the word is unknown. The gallon originated as the base of systems for measuring wine, and beer in England. The sizes of gallon used in these two systems were different from each other: the first was based on the wine gallon (equal in size to the US gallon), and the second on either the ale gallon or the larger imperial gallon. The ale gallon of 282 cubic inches (≈ 4.62 L). The corn or dry gallon was used in the United States until recently for grain and other dry commodities. It is one-eighth of the (Winchester) bushel, originally a cylindrical measure of 18 1/2 inches in diameter and 8 inches in depth. That made the dry gallon (9 1/4)2 × π cubic inches ≈ 6997440488409860128♠268.80252 in3. The bushel, which like dry quart and pint still sees some use, was later defined to be 2150.42 cubic inches exactly, making its gallon exactly 6997440488377086000♠268.8025 in3 (6997440488377086000♠4.40488377086 L). In previous centuries, there had been a corn gallon of around 271 to 272 cubic inches. 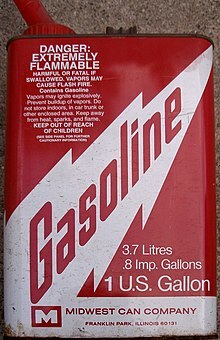 The wine, fluid, or liquid gallon has been the standard US gallon since the early 19th century. The wine gallon, which some sources relate to the volume occupied by eight medieval merchant pounds of wine, was at one time defined as the volume of a cylinder 6 inches deep and 7 inches in diameter, i.e. 6 in × (3 1/2 in)2 × π ≈ 230.907 06 cubic inches. It had been redefined during the reign of Queen Anne, in 1706, as 231 cubic inches exactly, which is the result of the earlier definition with π approximated to 22/7. Although the wine gallon had been used for centuries for import duty purposes there was no legal standard of it in the Exchequer and a smaller gallon (224 cu in) was actually in use, so this statute became necessary. It remains the US definition today. In 1824, Britain adopted a close approximation to the ale gallon known as the imperial gallon and abolished all other gallons in favour of it. Inspired by the kilogram-litre relationship, the imperial gallon was based on the volume of 10 pounds of distilled water weighed in air with brass weights with the barometer standing at 30 inches of mercury and at a temperature of 62 °F. In 1963, this definition was refined as the space occupied by 10 pounds of distilled water of density 7002998859000000000♠0.998859 g/mL weighed in air of density 7000121700000000000♠0.001217 g/mL against weights of density 8.136 g/mL (the original "brass" was refined as the density of brass alloys vary depending on metallurgical composition). This works out at approximately 6997454609030000000♠4.5460903 L (6997454609028199480♠277.41945 in3). The metric definition of exactly 7000454609000000000♠4.54609 cubic decimetres (also 6997454609000000000♠4.54609 L after the litre was redefined in 1964, ≈ 6997454609000341471♠277.419433 in3) was adopted shortly afterwards in Canada, but from 1976 the conventional value of 6997454609200000000♠4.546092 L was used in the United Kingdom until the Canadian convention was adopted in 1985. Historically, gallons of various sizes were used in many parts of Western Europe. In these localities, it has been replaced as the unit of capacity by the litre. ^ Ricketts, Carl. "CAPACITY MEASURES OF THE BRITISH ISLES" (PDF). Retrieved 6 September 2016. ^ "NIST Handbook 44 - 2012 Edition Appendix C "General Tables of Units of Measurement"". p. C-5. ^ Uniform Laws and Regulations in the areas of legal metrology and engine fuel quality (PDF). US Department of Commerce, National Institute of Standards and Technology. 2011. pp. 9–13, 69. ^ Authorized tables, US Code, Title 15, ch. 6, subchapter I, sec. 205, accessed 19 July 2008. ^ "FAQs – Fuel Consumption Program". Transport Canada. 5 November 2008. Archived from the original on 20 May 2010. Retrieved 31 July 2018. ^ Statutory Instrument 2001/3523 Environmental Protection - The Passenger Car (Fuel Consumption and CO2 Emissions Information) Regulations 2001 (PDF). The Stationery Office. 30 October 2001. ISBN 0-11-038743-0. Retrieved 1 December 2011. ^ "Gasoline goes up eleven cents per gallon tomorrow". Samoa News. Archived from the original on 4 March 2016. ^ "UPDATE: Gas prices down 10 cents to $4.73 for a gallon of unleaded". Pacific Daily News. Archived from the original on 30 September 2013. ^ JOY BLACKBURN (16 July 2012). "7-cent-per-gallon WAPA tax goes into effect". Virgin Islands Daily News. Archived from the original on 30 September 2013. ^ Pesquera de Busquets, Carmen T; Barcelo, Carlos Romero (14 June 1979). "Order to establish the price of half (1/2) galon [sic] of gasoline as transitory measure and that the litter [sic] should be the final metric measurement for the sale of gasoline in Puerto Rico" (PDF). San Juan, Puerto Rico: Departamento de Asuntos del Consumidor. Retrieved 21 May 2013. ^ "The Units of Measurement Regulations 1995 (Article 4)". 13 July 1995. Retrieved 1 December 2011. ^ "Units of Measurement Directive". LACORS. 1995. Archived from the original on 24 April 2012. Retrieved 26 November 2011. ^ "Guidance Note on the use of Metric Units of Measurement by the Public Sector" (PDF). Department of Trade and Industry. 1995. Archived from the original (PDF) on 7 February 2011. Retrieved 20 March 2017. ^ "S.I. No. 255/1992 — European Communities (Units of Measurement) Regulations, 1992". Irish Statute Book. Office of the Attorney General. 9 September 1992. Retrieved 1 December 2011. ^ Badih, Samia (30 December 2009). "Petrol stations in UAE go the metric route". Gulf News. Retrieved 11 September 2012. ^ "Gas prices at Guyoil stations remain below $1,000 mark". Caribbean Millers Association. 20 April 2011. Archived from the original on 28 June 2013. Retrieved 20 May 2013. ^ "Liters replace gallons at pump as Panama goes metric". Newsroom, Panama. 20 April 2013. Archived from the original on 25 May 2013. Retrieved 20 May 2013. ^ a b "International Fuel Prices 2010/11 - 7th Edition" (PDF). GTZ Transport Policy Advisory Services on behalf of the [German] Federal Ministry for Economic Cooperation and Development. p. 100. Retrieved 16 January 2012. ^ "Anguilla Renewable Energy Integration Project Final Report" (PDF). Anguilla RE Integration Final Report. Government of Anguilla Ministry of Infrastructure, Communications, Utilities, and Housing (MICUH). 19 October 2012. p. 104. Retrieved 13 October 2013. In 2008—the most recent year where WTI crude oil averaged US$100 per barrel—ANGLEC paid an average of about US$4 per imperial gallon (IG) for diesel. ^ "Budget Statement for 2012" (PDF). Antigua Observer. 5 December 2011. Archived from the original (PDF) on 2 October 2013. ^ Grenada: Third Review under the Three-Year Arrangement. p. 17. Retrieved 13 October 2013. ^ "GAS PRICES CAPPED UNDER $18 – LOWEST SINCE JULY". The St. Kitts-Nevis Observer. Archived from the original on 24 May 2012. ^ "Rotary has a new President - St. Lucia Voice News". Archived from the original on 22 December 2015. ^ "The Re-Launch Of Antigua And Barbuda's Metrication Programme". Diversity Global Magazine. 2013. Archived from the original on 16 January 2012. Retrieved 20 May 2013. ^ "thebahamasweekly.com - New Measures to Improve TCI Finances And Prioritise Spending". ^ "gallon, n.". Oxford English Dictionary (2 ed.). Oxford, England: Oxford University Press. 1989.